Since 1987, Camtech, Inc. has been supplying finished machined components to the automotive, military, electronic and hardware industries. We are a contract manufacturing shop that specializes in high volume machining of small components. Camtech uses CNC machinery that has been selected and tooled to process small components in the most efficient and economical way. Camtech processes parts complete from raw material, in addition to providing secondary machining to castings, forgings, screw machine parts, and powdered metal components. Camtech’s extensive experience in small component manufacturing assures that your parts will be processed by methods that yield both high quality and low cost. 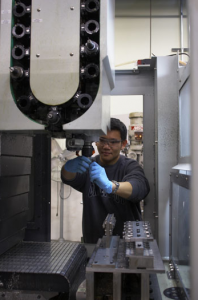 Our goal is to design processes that reduce the machining cycle to the shortest possible time. We want our machines to be constantly making chips. All our equipment and tooling is selected with this in mind. We look to make all non-cutting time internal to the cutting cycle. This is achieved with pallet systems allowing external loading of parts, automatic parts feeders, high speed tool changers, indexable carbide tooling and CNC controls. We create flexible machining cells that make it possible for machine operators to deburr, clean, inspect, and perform secondary operations while the primary machine is running. While Camtech is known for high volume production, we also have the ability to build prototypes and make low volume runs. If you have designed a product we can help you with process design and sample building. Camtech offers you the advantages of expensive automated equipment without the investment…contact us to discuss and quote your requirements.